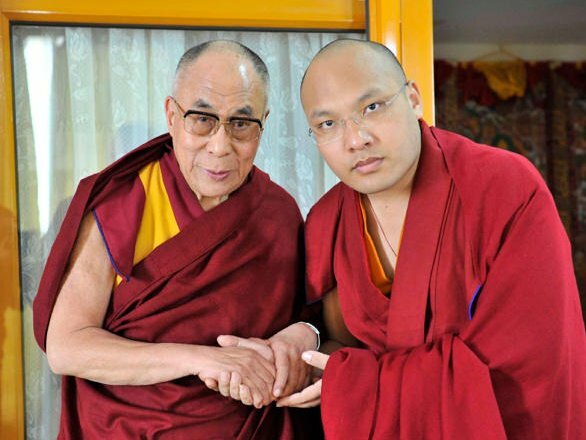 As the spiritual head of the 900-year-old Karma Kagyu lineage of Tibetan Buddhism, His Holiness the 17th Karmapa, Ogyen Trinley Dorje, has emerged as an important thought leader for our time. Since his dramatic escape from Tibet to India in 2000, the Karmapa has played a key role in preserving Tibetan religion and culture. He has been described as “a world spiritual leader for the 21st century,” and has inspired millions of people worldwide to take action on social and environmental issues. At the age of 29, the Karmapa’s message has particularly resonated with young people, whom he encourages to take responsibility to create a more compassionate future for the planet. “Karmapa” literally means “He Who Performs the Activities of the Buddha” and the Karmapa lineage itself is known for putting Buddhist principles into action. The Khoryug association that he founded has transformed over 55 monasteries across the Himalayan region into local centers for environmental activism. Leading on women’s issues, in January 2015 the Karmapa made the historic announcement that he will establish full ordination for women, a long-awaited step within Tibetan Buddhism. In his latest book, The Heart Is Noble: Changing the World from the Inside Out, the Karmapa speaks to the younger generation on the major challenges facing society today, including gender issues, food justice, rampant consumerism and the environmental crisis. He is currently working on a subsequent book based on his interactions with American university students, which discusses how to live according to the principle of interdependence in an era of technological connectivity and emotional disconnection. In recent years, the Karmapa has increasingly sought out opportunities for more sustained interactions with university students. He has engaged with groups of students at a number of Indian universities, with Tibetan student groups and has also had held several series of meetings with students from Europe and North America. A leader of the new century, His Holiness the Karmapa makes effective use of technology to transmit and teach the Dharma widely. When he delivered a talk at a TED conference in Bangalore in 2009, he was the youngest speaker to have done so at that time. His teachings are often webcast live with translation into a dozen languages. 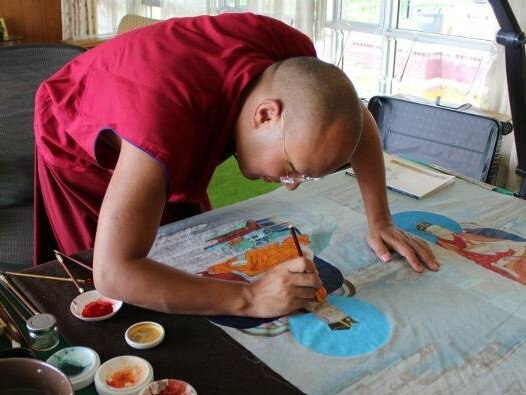 His Holiness the Karmapa engages in a wide range of artistic activities. He paints, draws calligra­phy, writes poetry and plays and composes music. 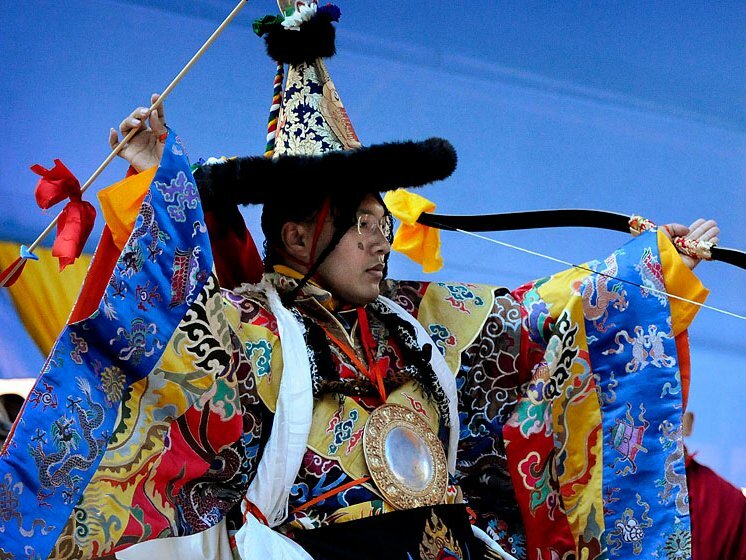 Preserving and renewing Tibetan artistic forms, the Karmapa has written and produced several plays that com­bine elements of traditional Tibetan opera and modern theater. His first play, a drama on the life of the great Tibetan yogi Milarepa, was attended by 20,000 people at a single live performance in India, and will be published in an English translation during this visit to the United States. The 17th Karmapa, Ogyen Trinley Dorje, was born in 1985 to a family of nomads in the remote highlands of the Tibet­an plateau, and spent the first years of his life in a pristine environment free of modern conveniences, electricity and motor vehicles. When he was recognized as the reincarnation of the 16th Karmapa at the age of seven, he left this nomadic lifestyle behind. He was formally enthroned as the 17th Karmapa with two of the three living heads of his lineage officiating. Once installed in his monastic seat of Tsurphu Monastery in central Tibet, at the age of eight he delivered his first public religious discourse to an audience of over 20,000 people. In the years to come, the Karmapa would face numerous chal­lenges in his efforts to perform his spiritual activities. Concerned that he would be unable to meet his religious obligations, he decided to escape from Ti­bet at the age of 14, seeking the freedom to fulfill his religious responsibilities. He has been living in Dharamsala in northern India, a short distance from the resi­dence of His Holiness the Dalai Lama with whom he continues to enjoy a close relationship of mentor and protégé to this day. The Karmapa receives thousands of visitors at his residence in northern India, and discusses practical global solutions with people from all around the world. In 2004,, His Holiness assumed responsibility for the Kagyu Monlam, an annual gathering to make aspiration prayers for world peace, which is held in Bodhgaya, the site where the Buddha became enlightened. Under his guidance, this annual event has grown to over 12,000 participants, and is watched online via live webcast by tens of thousands of devotees with simultaneous translation into over a dozen languages. In 2009, the Karmapa founded Khoryug (Tibetan for environment) and chairs this association of over 55 Buddhist monasteries and nunneries across the Himalayan region. 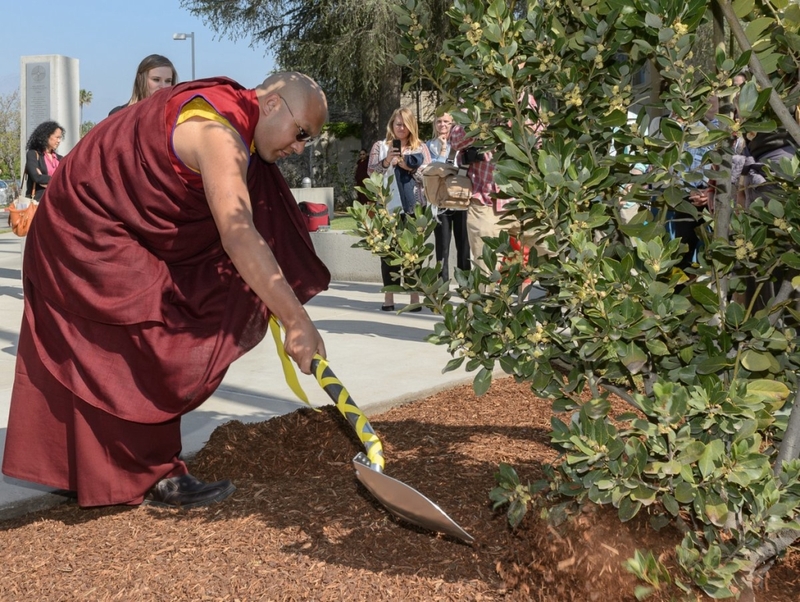 His efforts have educated thousands of monks and nuns, mobilizing them to lead their local communities on environmental issues and to implement projects that have turned their own homes into eco-monasteries. In 2015, the 17th Karmapa made history with his announcement that he would take the first step in establishing bhikshuni ordination for nuns within Tibetan Buddhism. In 2014, the Karmapa had already instituted an annual Arya Kshema Winter Dharma Gathering for Karma Kagyu nuns extending access to rigorous education for nuns, and arranging for empowerment initiatives in the nunneries. Within his own school of Tibetan Buddhism, he has been modernizing religious practices, yet remains firmly rooted in tradition as he re-invigorates monastic discipline in his lineage. 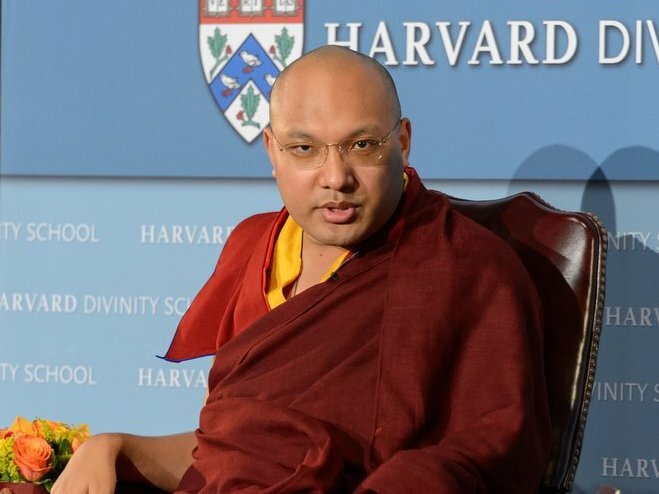 During his most recent visit to the United States, His Holiness the Karmapa gave lectures on such topics as gender justice and environmental protection at Stanford, Harvard and other university campuses cross the country, with time to visit national parks and engage in dialogues at headquarters of such companies as Google and Facebook to discuss ways to foment a kinder Internet culture. In 2014, the Karmapa made his first long-awaited first trip to Europe. Along with major teachings at his European seat and to massive crowds in Berlin, he joined Vespers service at a Benedictine abbey, received a private tour of the Cathedral of Cologne, met with the chief rabbi of Berlin and paid his respects at the Holocaust Monument. His most recent book, Nurturing Compassion, was based on his teachings during that trip, and can be downloaded for free here. Adapted from the Karmapa’s official biography.